In the world of RF (Radio Frequency) electronics, normal “bench-top” circuit components cease to operate the way they were designed to. This means a normal resistor can become a capacitor, a capacitor can become an inductor, and a normal wire can become a distributed network of inductors and capacitors. This highly non-ideal behavior occurs because, in reality, no true resistor, capacitor, inductor, or wire exists; rather they are all processed and manufactured to operate within a certain frequency range – at frequencies where the real-world effects are quantitatively insignificant. However, as one approaches RF frequencies, these real-world effects become much more pronounced in cheap components. Eventually, the frequency of operation can become so high that the transmission line itself – no longer a simple wire – will exhibit significant signal-loss. But even with lossless transmission lines, it is important in communications to “match impedances,” i.e. attach an antenna whose impedance matches that of the signal source – this maximizes the transmitting-antenna’s power dissipation (and “reflects” back zero power). 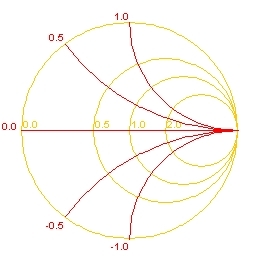 Indeed, being able to calculate and measure the impedances of antennas, transmission lines, etc is very important within RF design, which are almost always complex numbers. Another reason determining load impedances is important is because of the 1:1 mapping between a value of load impedance and a corresponding value of , the reflection coefficient (a ratio of how much a signal is reflected versus how much a signal is radiated for a given load). where is the impedance the chart was normalized from. By using this method, it is simple to find the impedance represented by any point on the Smith Chart! Questions? Comments? safa@ksu.edu – Or please leave a comment below for the author!